Michael aged 90 suffered a stroke a few years ago. The effects of the stroke necessitated him going into a care home. The care home looked after him well but unfortunately despite the best efforts of his family who were taking him out of the home for long periods during the day he was becoming more unsettled and missing his home comforts and surroundings together with the freedom he had previously enjoyed by living in his own home. His family contacted Home Instead. We designed a care package that allowed him to obtain the care and support he required yet, also provided him with the freedom to live independently and enjoy life to the full. He now has a team of regular caregivers supporting his every need, he sees the same faces at the same time every day - he refers to the caregivers as “his angels”. Michael is a very active 90 year old so as part of the care plan Home Instead organise and accompany him on a number of days out which keep him active and involved in the community. 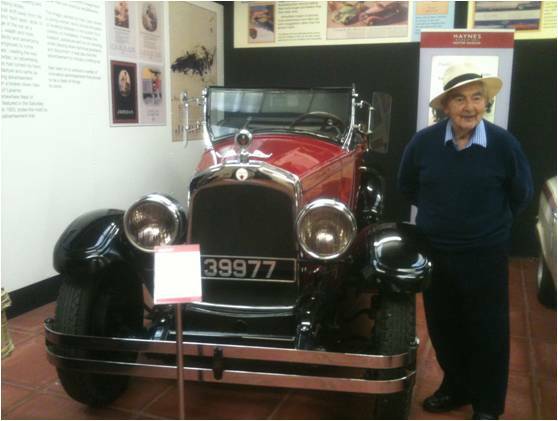 The picture below was taken at the Haynes Motor Museum on one of his trips – Home Instead had this picture framed and he displays this alongside all his family photos in his home. Since engaging with Home Instead, Michael’s communication has improved tremendously and he is living life to the full!